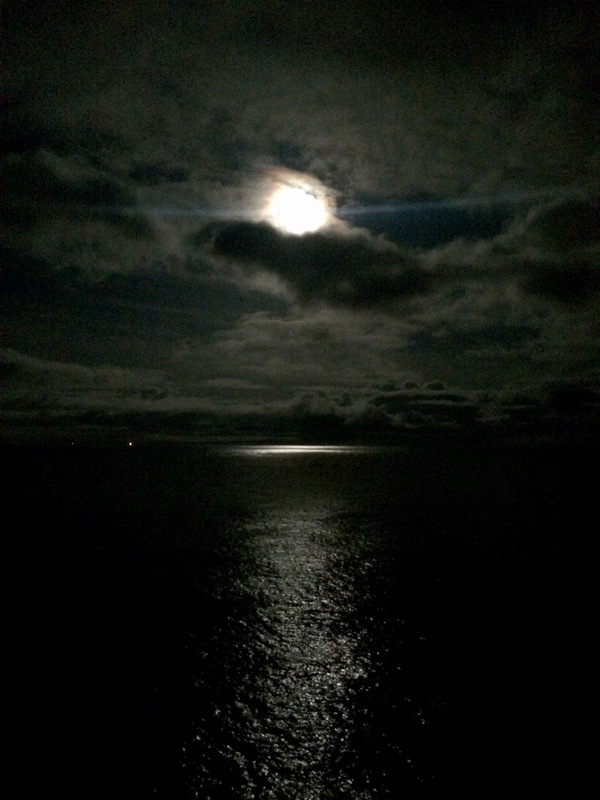 The full moon lights up the night on top of the flying bridge. Later on Monday, once all the night-shifters had risen from their beds and were beginning to get ready for the bongos and mid-water trawls, I took a tour of the engines with marine engineer and NOAA crewmember, Colleen. We started in the control room. With up to four engines operating at any one time, Colleen says it’s a relief that computer systems help to automate the process. As part of her four-year degree program at Seattle Maritime Academy, she learned how to operate the engines manually as well, but I think we can all agree computers make life easier. Before moving on to the actual engine room, Colleen made sure I grabbed some ear protection. For a one-time visit they’re probably more for my comfort than to protect from any real damage, but because she’s working with the engines every night, it’s important to protect against early-onset hearing loss. Once the plugs were in, we were basically not going to be able to talk so Colleen made sure that I knew everything I was going to see before we proceeded. Colleen in the control room. First, we made our way past the fresh water tanks. I was really curious about how we get fresh water on the ship, since we’re in the middle of the Pacific Ocean. The Shimada produces freshwater using two processes. Reverse osmosis produces most of the water, using high pressure to push the seawater across a membrane, a barrier that acts like a filter, allowing the water molecules to pass through but not the salt. This is an energy intensive process, but the evaporators use the excess energy produced by the engines to heat the seawater then pass it through a condensing column which cools it, and voilá, freshwater! Next, we came to the four diesel engines. Four engines. These four engines are rarely all on at one time but never will you find just one doing all the work. That would put too much strain on and probably burn out that engine. While they burn diesel fuel, like a truck, instead of using that energy to turn a piston like the internal combustion engine of that same truck, they convert that energy to electricity. That electricity powers the two motors that ultimately make the ship go. Panoramic view of the engine room, engines 1 and 3 can be seen in foreground and engines 2 and 4 in the background. A ship the size of the Shimada requires a lot of power to get moving, but Colleen tells me it gets decent mileage. Though the ship’s diesel tank can hold 100,000 gallons, there’s only about 50,000 gallons in the tank right now and the ship only needs to refuel every couple of months. After a quick pass by the mechanics for the rudder, the fin-shaped piece of equipment attached to the hull that controls the direction the ship is traveling we arrived at our last stop: Shaft Alley. Those two motors I told you about work together to turn a giant crankshaft and that crankshaft is attached to the propeller which pushes water, making the ship move. When I was down there the ship was on station, where it was holding its location in the water, so the crankshaft was only turning at 50 RPM (rotations per minute). It was a pleasure getting a tour from Colleen! Throughout the night, the Shimada revisits the same transect stations that it visited during that day, but uses different nets to collect samples at each station. To the right, you can see a map of the stations; they are the points on the map. Each line of stations is called a transect. Looking at the map it’s easy to see that we have a lot of work to do and a lot of data to collect. The transects and stations within them that the Shimada will survey at. Why does this have to happen at night? At night, the greatest migration in the animal kingdom takes place. Creatures that spend their days toward the bottom layers of the ocean migrate up, some as far as 750 m (almost 2,500 ft)! Considering they’re tiny, (some need to be placed under the microscope to be reliably identified) this is relatively very far. And they do it every day! To collect data on these organisms, three types of nets are used, two of which are not used during the day. Along with the surface-skimming neuston (which is used during the day), the bongo net, so named because it has two nets and looks like a set of bongo drums, and the Cobb trawl which is a very large net that needs to be deployed off the stern (back of the boat). The operation of the bongo net is similar to the neuston, it is lowered off the starboard (when facing the bow, it’s the right side) side of the boat. Dropping down to 100 m below the surface and then coming back up, the bongo is collecting zooplankton, phytoplankton and fish larvae. The samples are poured from the cod-end into a strainer with a very fine mesh and since the water is full of those tiny bits, the straining can take a bit of time and some tambourine-like shaking. The Cobb trawl on deck, waiting to be deployed. These samples are then fixed (preserved) in ethanol and they will be analyzed for diversity (how many different species are present) and abundance (how many individuals of each species is present). The bongo is the net of choice for this survey because once scientists go to process the data, the double net provides a duplicate for each data point. This is important for statistical purposes because it ensures that the area that is sampled by one side of the net is similar enough to the area sampled by the other side of the net. Below you can see video of the bongo net after it’s been hauled back. Scientists are spraying it down to make sure all organisms collect in the cod-end. Once the bongos are done, comes the real action of the night shift. The mid-water trawls take 15 minutes. I’ve become really great at communicating with the bridge and survey technicians who are operating the nets so that I can record data for the beginning and ending of the trawls. 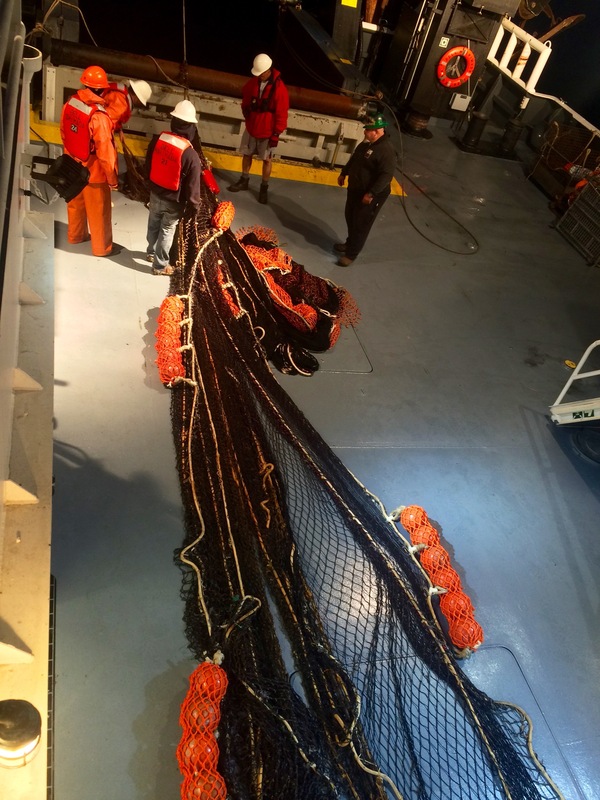 Once the catch is on deck, the survey technicians empty the cod-end into a strainer. The scientists prepare to sort, count and measure the species of interest. If the catch is large or particularly diverse, this can be a significant task that requires all hands on deck. With four trawls a night, some with 30-50 minutes transit time with nothing to do in between, fatigue can set in and make the work hard to finish. To make it through the night, it takes great senses of humor and playful personalities. A little theme music doesn’t hurt either. The scientists of the night shift, under the direction of Toby Auth, a fisheries biologist with Pacific State Marine Fisheries Commission working as a contractor to NOAA and Chief Scientist Ric Brodeur, are Brittney Honisch, a marine scientist with Hatfield Marine Science Center, Paul Chittaro, a biologist with Ocean Associates working as a contractor to NOAA, Tyler Jackson, a fisheries science graduate student, and Will Fennie. The data collected during these trawls provides a snapshot of the ecosystem. This data will help NOAA Fisheries Service understand the health of the ocean ecosystem as well as how large certain populations of commercially important fish are such as hake and rockfish. In the meantime, it provides for some late night fun. Over the course of the nights that I’ve spent in the wet lab, we have uncovered some bizarre and fascinating creatures. The flat ones are larval Pacific sanddabs (Citharichthys sordidus) and the long skinny ones are larval anchovies (Engraulis mordax). Clockwise from right: Mature hake, young lanternfish, King-of-the-Salmon, curlfin turbot, poacher. A Leptocephalus larvae of deep sea eel. A tiny larval octopus (Octopus sp.)! I will call him Squishy and he will be my Squishy. Krill (Euphausiids) with phytoplankton in their stomachs (green). Shortbelly (Sebastes jordani) and canary rockfish (Sebastes pinniger), actual rockfish! In juvenile form. But in my opinion the real star of the trawls was the young female dogfish. A dogfish is a type of shark. I know what you’re thinking and no, she did not try to bite us. But dogfish do have two spines, one at the base of each dorsal (back) fin. We all fell in love, but, ultimately, had to say goodbye and return her to the sea. Thank you for your patience as I’ve gathered the images and video to make this and future posts as informative as possible. Stay tuned for Episode 5 coming soon! First off, a heartfelt CONGRATULATIONS to the first 8th grade class at Village Leadership Academy. I wish I could be there when you walk across that stage on June 4th. Little did I know when I started hanging out with the scientists of the night shift that it would become a way of life. Each night I managed to stay up later and later and finally last night I made it through all four catches and almost to 0800, the end of the night’s watch. After dinner (some call it “breakfast”), I slept a full eight hours, and it felt completely normal to be greeted with “Good Morning!” at 3:30 in the afternoon. Speaking of the night’s watch, I’m really grateful that someone was able to get one of my favorite TV shows last Sunday. And Game 7! The Blackhawks are in the finals! Even though I can’t call anyone back home to discuss my theories or that amazing goal by Seabrook in the third period, I can email and it feels like I’m missing less. The only person I can’t email is my cat, Otto! I can’t wait to snuggle him until he scratches me. Otto the cat. He loves snuggling. Comment with answers to these questions and I’ll shout your name out in the next post! What is your favorite animal we have seen so far? Thanks to Paul Chittaro for assisting in the use of iMovie for this post! This entry was posted in 2015, Alexandra Miller, NOAA, NOAA Fisheries Service, NOAA Teacher at Sea and tagged bongo nets, dogfish, engine room tour, jellies, juvenile fish, juvenile fish survey, larval fish, mid-water trawls, NOAA Careers, NOAA Ship Bell M. Shimada, STEM careers, weather data. Bookmark the permalink.